Google's virtual globe application that allows users to view 3D buildings, imagery, terrain, any other information stored in KML files. Google Earth is a virtual globe, map and geographical information software application that runs on Windows, Mac, and Linux platforms. It maps the Earth with images obtained from satellite imagery, aerial photography and 3D globe combined with multiple independent layers such as border labels & outlines, roads, 3D buildings, traffic/weather data, and more. Additional information can be viewed by opening other KML files, and the software allows new KML files to be easily produced. Release timeline and versions for different platforms on Wikipedia. 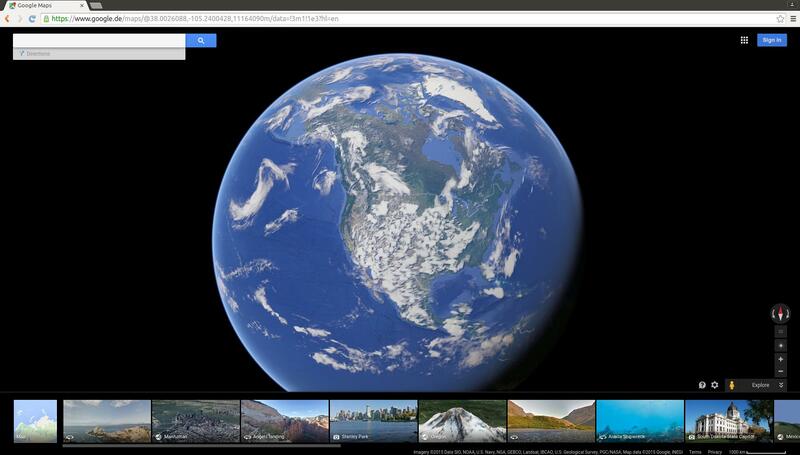 The 3D globe view is also available in the new Google Maps interface which was previewed in 2013 and which replaced the classic Google Maps interface as of April 29, 2015 according to Wikipedia. Google Earth also includes Street View, which was extended into Views in the new Google Maps interface. Comparing Google Earth Enterprise to ArcGIS for Server and GeoServer? Where are the oil platforms in Google Earth? Linking Geoserver WMS layer to Google Earth?